Let the life and bounty of nature surround your iPhone. Sturdy, durable leather-clad hard rubber case for snug fit and protection. Regular sizes fit iPhone 6, 6S, 7, 8, X, XS. Plus sizes fit iPhone 6 Plus, 7 Plus, 8 Plus, XS Max, XR. 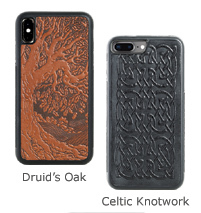 Choose Druid's Oak or classic Celtic Knotwork. Made in USA.